A sweet chili sauce is my favourite condiment, I use it on everything from bacon sandwiches through to glazes for bbq ribs. When people come visit our wee plot of of land here in Rural Hungary when we are in the growing season one of the first questions we are asked is why on earth do we have so many chili plants. 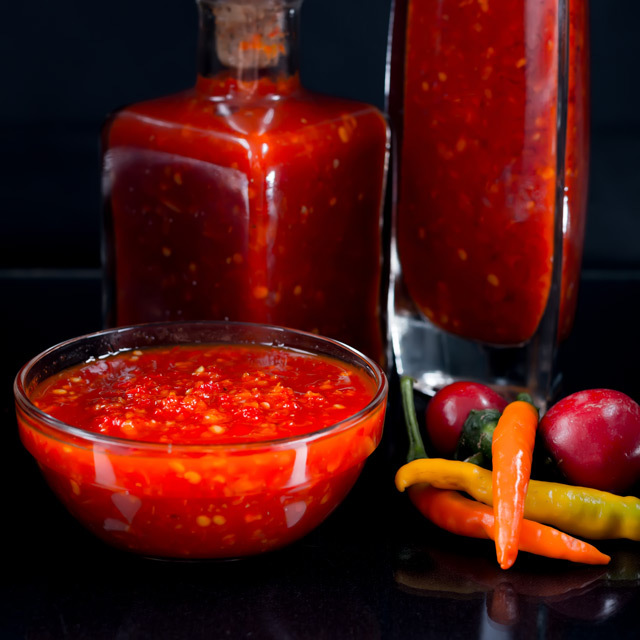 Our answer is usually sweet chili sauce, admittedly we actually do a lot more with them everything from pickled chili through to dried chilis and even homemade cayenne pepper, but our go to is sweet chili sauce. I have scaled back this recipe to make a ‘normal’ sized amount of chili sauce but usually I make it in huge batches and we use it in everything from soups and stews to glazes for chicken and that is before we have even considered using it as a dipping sauce. In fact in many ways chili sauce has replaced ketchup and as far as I am concerned I will not consume a bacon sandwich with anything else other than sweet chili sauce. The shop bought variety is seems unusually orange and has a very odd texture and very little of the character of the chili used to make the sauce. It is kinda generically spicy and exceptionally sweet. This is very different, sure it is spicy, it is made of chili after all but you can almost taste the different characteristics of the chilis used in the sauce and whilst it has a sweetness it does not have that clawing texture that hangs around forever. I would not necessarily call myself a chili connoisseur but I do know that all chilies have different flavours as well as heat levels so I typically mix the chili varieties in my sweet chili sauce. The main component is made from cherry bomb chilies, these are roughly the same sort of heat as a jalapeno pepper but are very heavy on the seed front so I remove the seeds from these. They also have a bitter sweet flavour that works really well in a chili sauce. I then use some golden cayenne which carry a much heavier kick of heat but also an almost citrus back note and the some Thai Birds Eye chili peppers. I use these with the seeds in but they form no more than 10% of the over all weight of the amount of chili I use. 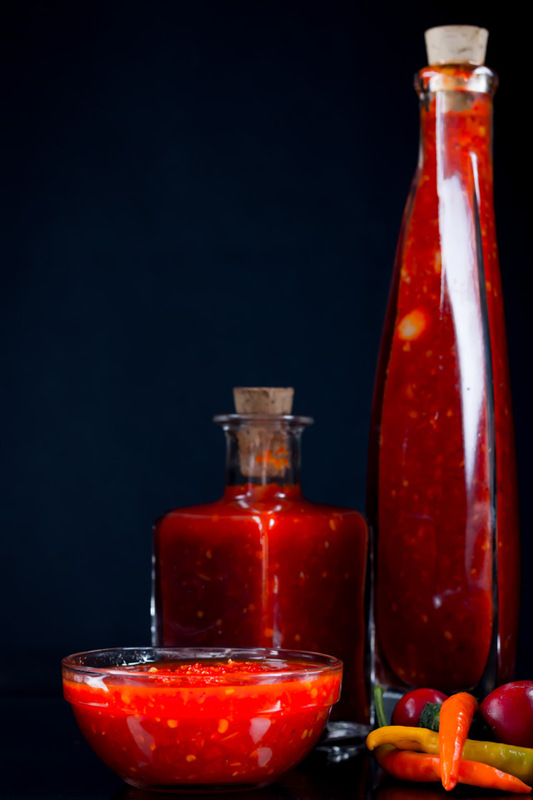 However make it work for yourself, this recipe scales beautifully, I took my usual recipe for making 5 litres of sweet chili sauce and tested it for this recipe that make just 1 litre and you could not tell the difference between them. Use the chilies you can get your hands on or the chilies you like the flavour of and just go wild and crazy, nothing spices up a meal than a little splash of this mighty treat. 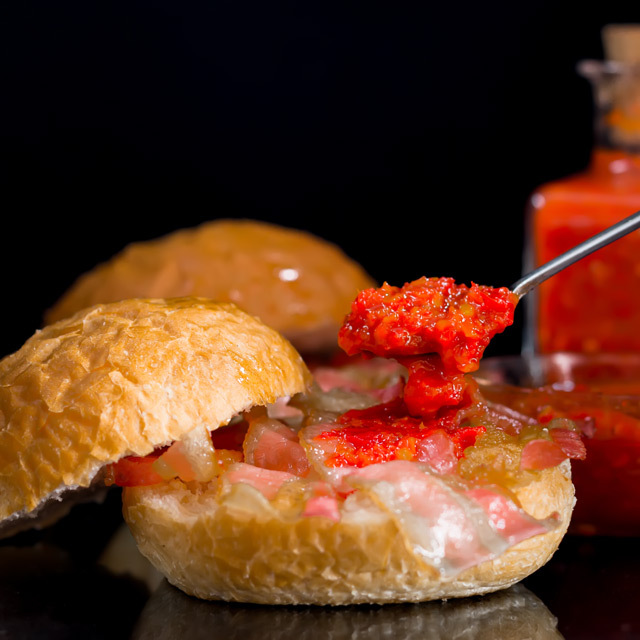 We always batch make this recipe from our home grown chilies and it will last for at least a year, we usually run out just as our next harvest comes to fruition and this recipe will yield around 1 litre of sauce. The calorific value of this recipe refers to the full amount. Aaaaah, this is an absolute fav of ours with hot deep fried snacks 🙂 Great recipe. Cheers Molly, I have this with all sorts of stuff and deep fried snacks do work wonderfully well with it. Just opening up your page made my mouth water! I’ve got to make this sauce. It looks so very tasty. I like it when that happens 😉 I hope you enjoy it, it is really simple to make. Loved the colour. Thanks for sharing this recipe. Would love to try this . This sauce looks absolutely amazing. 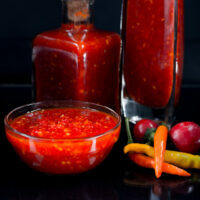 Love the color and am drooling….I love sweet chili sauce. I will definitely try this recipe. Thanks for sharing! Thanks Sandhya, I hope you enjoy it, so simple to make and much tastier than commercial sauces! Thanks for the recipe.. so nice to make the sauce at home.Will try it. Very useful post….always homemade is the best!! So glad I caught this recipe! Our families are from southeast Asia and we put sweet chilli sauce in everything. Never thought to make it ourselves but now that our parents have chilis growing in their garden, this is perfect!! Excellent Gabriel, I love making things from scratch and our chili harvest this years has been huge 🙂 Let me know how you get on.